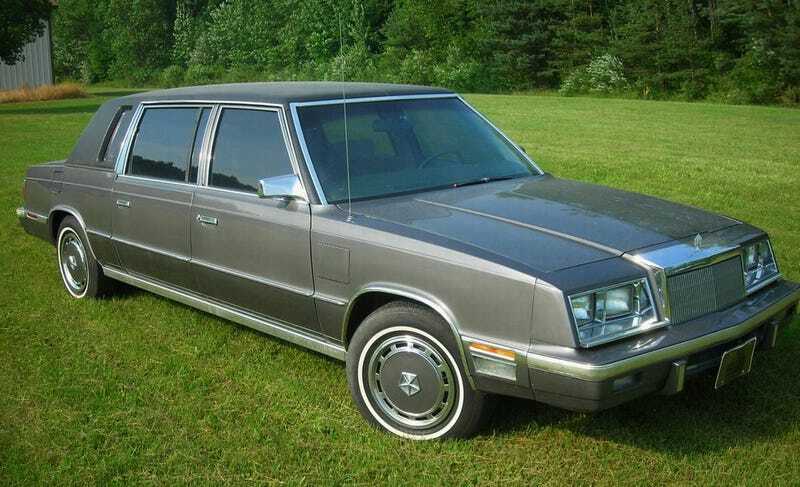 Would You Consider $3,750 For This 1984 Chrysler Executive Sedan To Be A Stretch? Today’s Nice Price or Crack Pipe Chrysler Executive has an extended wheelbase and a dashboard that talks. Let’s see if this rare K-car also has a price that speaks to you longingly. Have you ever noticed that while you still hear about the occasional flat earther spouting their ludicrous beliefs, you never, ever hear about flat mooners? That’s probably a good thing because getting mooned is only ever a good thing if the mooning booty in question is boldly bodacious. A lot of us got mooned yesterday, owing the rare event of our natural satellite transiting between the Sun and the rock we call home-sweet-home. In ancient times such an eclipse would be cause for panic. Nowadays it calls for cars like yesterday’s 1981 Toyota Celica Sunchaser. Rare, fun, and funky, that little multiphase convertible also proved a decent value as fully 84 percent of you voted for its $2,500 asking in a Nice Price win. The darkness that spread over much of the United States yesterday was nothing compared to the darkest days the Chrysler Corporation faced back in the 1970s. The company was on the ropes financially and needed a government loan to keep the heat on and the cars pumping out. Lee Iacocca secured that loan, and led the company back to short term profitability carried on the back of the K-car platform, a new FWD architecture that Chrysler would leverage for the next decade and half underpinning damn-near three-quarters of their line up. That K-car would sire a number of amazing and remarkable offspring, including Shelby imbued sport sedans and a people mover than spurred the modern minivan era. Along with those hits however, there naturally were a a number of misses, and not the good kind as in unmarried girls. Now, this is in fact da bomb right now in China where long-wheelbase “executive sedans” are commonplace, so perhaps Chrysler was just a few decades and one hemisphere off with these models. The Executive Sedan was based on two LeBarons, a four-door sedan cut at the B pillar and a Coupe cut between the A and B pillars. These were wed together with modified front doors in back, all riding on a 124-inch (Executive Sedan) or 131-inch (Limousine) wheelbase, and wiener dog-like proportions. The stretch was held together with additional steel structure welded in underneath, and all the work was done by American Specialty Corporation. That company was also engineering a convertible K-car at the time so they knew their way around the platform. About 200 cars were converted over its two model-year run. This Executive Sedan comes to us in charcoal grey with matching full vinyl roof and silver tuffed velour interior. Unlike the Limousine, which featured a cabin divider and a pair of jump seats for seven passenger capacity, the Executive Sedan is a single cabin/five-seat model, albeit with a ton of legroom in back. If you needed a mobile naked Twister parlor, this car would suit your needs just fine. The bodywork looks to be straight and without flaw. Full wheel covers bling-up the 13-inch rubber, made even smaller in appearance owing to their enhanced separation. There’s a Continental Kit and boomerang antenna on the back for a little added… um, class. Inside. there’s a unique console containing air passages in front, and positionable foot rests in the back. The dashboard is a crazy ‘80s digital unit with a voice system that will tell you that “a door is ajar” but not whether people are laughing at you for riding around in a extended wheelbase K-car. The upholstery looks like there should be a bowl of ribbon candy somewhere in there, but it seems serviceable nonetheless. Perhaps less serviceable is the 2.6-litre Mitsubishi four under the hood. That’s mated to a three-speed automatic (what, you were hoping for a stick?) and the combo is a little overwhelmed by the Executive Sedan’s ton and half weight. Of course, a car like this isn’t about getting there with alacrity, it’s about getting there in style. This one has been styling for 140,000 miles and comes with a new fuel pump, replaced radiator, and a clean title making it pretty much ready to rock your economy ticket luxury world. To do so, you’d need to come up with $3,7590, and it is now incumbent upon you to decide if that makes sense of not. What’s your take on this 1984 Executive Sedan and that $3,750 price? Is that a deal, or does that feel like just too much of a stretch? Detroit, MI Craigslist, or go here if the ad disappears. H/T to Steven Owens for the hookup! At $2,500, Would You Let This 1981 Toyota Celica Sunchaser Darken Your Doorstep? For $9,500, Ride In The LimouSven!